IS PACQUIAO'S FAIRY TALE CAREER HEADED FOR A TRAGIC ENDING? Over the past couple of days, there has been more talk about Manny Pacquiao's finances than his upcoming November clash against rival Juan Manuel Marquez. Despite Pacquiao being one of the most popular athletes in the world, reports previously surfaced that Pacquiao's net worth is a shockingly low $26 million, which should come as no surprise since FightHype's own Ben Thompson has been quite busy documenting the back-channel talk between the Pacquiao camp and VisionQwest in terms of how Pacquaio's finances are being handled. What many people may not realize, however, is that Pacquiao's money problems haven't come from crooked promoters or bad business deals; instead, it's come from the wild nightlife that has accompanied his celebrity. According to several reports, Pacquiao's trainer, Freddie Roach, disclosed to filmmaker Brin-Jonathan Butler that while Pacquiao has made him a fortune, his star charge is broke and will have to continue fighting to sustain his career. Following this, Joey Aquino from Journal Online alleged that Pacquiao has gambled away a fortune back home in the Philippines, which lead in turn to him selling one of his houses. When you combine these factors together with the fact that Pacquiao hired an outside firm to manage his finances, along with the heavy pushback from his boss Bob Arum to dump the service, it seems that Pacquiao is finding himself not standing at the top of the mountain, but rather on the edge of his own personal abyss. Thanks to excellent public relations, Pacquiao's wild past has been a distant memory for us here in the U.S. as he has been shown to be a man willing to help anybody around him as a result of his good fortune inside the ring. Casual fans eat this up, seeing Pacquiao as a man of God, a national hero who is hoping to change lives not only in the ring, but in his own government as an elected official. It's a storyline that could be found in a modern blockbuster movie, and it sure as hell beats the alternative when it comes to his past. Gambling has always been an issue with Pacquiao. He himself admitted that he may have fathered a child out of his marriage in 2006. The guy is so well-known for giving away his money that it would make MC Hammer blush. Further allegations of his financial problems go into Pacquiao's political aspirations, dropping $20 million across two campaigns to run for public office. In the report mentioned earlier, Roach also said that Pacquiao flies a large group of people from the Philippines to the U.S. and pays for their lodgings as well, something we've seen in prior 24/7 episodes featuring Pacquiao and his groupies. At 32 years of age and closer to the end of his career than he is to the beginning, it may seem that Pacquiao has yet to take that long look in the mirror to ask himself what will come next once his legendary career comes to a close. Evander Holyfield was a fighter who also was beloved by the public for his never-say-die approach in fights and his faith in God, but what we never paid attention to at the time was Holyfield's promiscuity as he fathered 11 children, almost all of whom he pays child support to. Couple that with being behind $10 million in payments for a home in Georgia and it's no surprise that, at 48, Holyfield is still trying to score the big payday. With Holyfield's career certainly winding down to what also many predict to be a tragic end, we now see the motivation for what he's fighting for and that's simply just to pay his own bills. The same can certainly be said for such admired athletes like Oscar De La Hoya, Ricky Hatton and Joe Calzaghe, who's drug addictions would be ousted by the public when their careers came to an end. The career of a politician in a third or second world country pales in comparison to what a top fighter can make on a card in Las Vegas, which is why Pacquiao is still fighting and will still continue to fight. 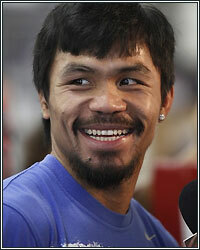 Roach has expressed heavy concerns for the well-being of Pacquiao in the past. To go a step further, I myself really hope that Pacquiao's life after boxing isn't consumed by his demons due to being unable to ease into a life without the crowds cheering his name every night. I keep telling myself that this is a fairy tale that will have a happy ending, but in this sport, it's usually the ones you don't know about that fall the hardest. Danny Howard can be reached via e-mail (dhoward@fighthype.com) Twitter (@DBHoward126) and on Facebook.